This section summarizes some of the data processing steps required during or after acquisition. As illustrated in Fig. 146, the EM receiver measures both the primary EM field from the transmitter and the secondary fields from conductive anomalies. 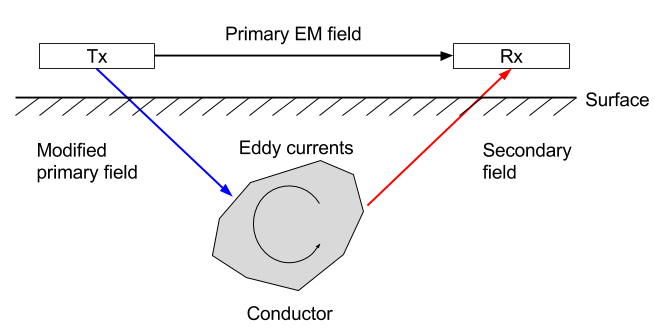 In most cases, the amplitude of the primary field is much larger than secondary fields and must be removed from the measured data. One option is to physically cancel the primary field with second transmitter place near the receiver, also known as a bucking coil. The bucking coil is calibrated to match exactly the strength of the primary field at the receiver location. This calibration needs to be performed away from known conductors, or for the airborne case, at high altitude. The second option is to filter the primary field in post-processing.